Once you've made your event live, you'll want to start promoting it so that people visit your page and purchase tickets to your event. The Publicize page gives you access to an assortment of promotional tools that have been specially designed to drive traffic to your event page and boost your event's marketing strategy. Every event you create generates its own Publicize page. To access the Publicize page, first click the Manage Events link at the top of the page. From the Manage Events page you'll see a list of your events. Click the More link on the right side of the page in the row with the event you would like to publicize. A menu will appear with a list of options. Click Publicize. When you’re on the Manage Events page, you can also access the Publicize page by clicking the name of your event, and then clicking the Publicize button on the menu bar at the top of the page. A great way to inform a large number of people about your event is to share it on social media. Within the Social Media section you will find icons for Facebook, Twitter, Google+, and LinkedIn. To post on one of these sites, click the icon for the social media platform you would like to use and follow the instructions in the dialog box that appears. If you're not logged in to the site you're trying to post to, you'll be prompted to enter in your credentials. Once you're logged in, you will be able to enter in text to create a post about your event and share it with your followers. Share your event across all of your networks for maximum exposure! With just one click of the green Create Facebook Event button, you can automatically transfer your event information to a Facebook event page. Doing this adds a Get Tickets link to Facebook directs back to your event page on ezEvent®. You must have a Facebook Page in order to create your event on Facebook. If you have specific people in mind that you'd like to invite to your event, you can use the Email Marketing feature to promote your event by email. The emails will be sent over our secure servers. To create your mailing list, click the Import your contacts button. Doing this will open a tool that can import email addresses from Gmail, Yahoo!, AOL, MSN, Plaxo, and/or Outlook. Click the link for the mail service you want to import your contacts from, and follow the instructions provided. When the addresses are imported they will show up in the "To" text box. If you don't have your contacts saved in one of the provided mail services, you can manually enter the email addresses into the text box. Be sure to separate each email address with a comma. After you've built the invite list, you'll want to add in content to the email invitation. The invitations come pre-filled with some basic information about the event, such as the event name, host, date, time, and location. The invitation also contains a link to a map of the event location, social media buttons leading to ezEvent®’s social media pages, and a link to your event page. You can add your own custom text by typing in the "Enter Your Message Here" field. You can also create a subject line for your email by entering text into the "Subject" field. To send your message, you will need to type the characters you see in the Captcha image. This security technology protects your events from bot activity. Click the green Send Message! button to mail your invitations. If you're hosting several events at once, the Calendar Widget is a simple and clean way to post them all on your website. Simply copy the HTML code provided, and paste it into the code of your website. You can customize the height and width so that it fits perfectly where you need it to. The calendar has two different tabs that customers can alternate between to view your events. The calendar tab allows potential buyers to click through each month of the year to see which dates have events. If an event is taking place on a certain date, it will be highlighted in green. Clicking the date will reveal the event logo, event name, data and time, and location. 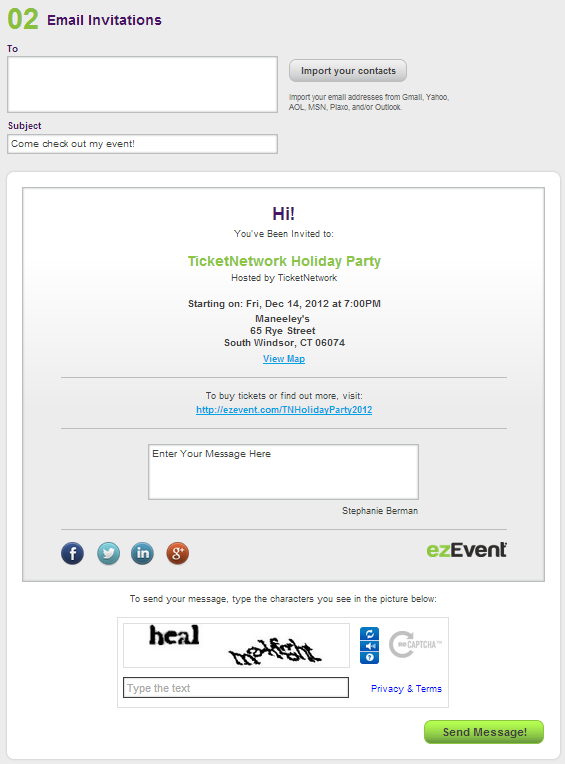 There is also a Buy Tickets button that points back to your ezEvent page. The second tab, List, is a chronological list of your live events. It features the event name, date, and time, and there is a Buy button that directs users to your ezEvent page. Please keep in mind that the calendar widget does not allow you to select which events are displayed; It simply displays all of your live events. If you have a website you'd like to use to build event awareness and promote ticket sales, you can do so by using our button widgets. Simply copy and paste the provided HTML into the code of your website. Widget Option #1 is an event box that features the Event Logo, Event Name, Start/End Date, Start/End Time, and Location. In the middle of the box is a Buy Tickets button that brings customers directly to your event page. 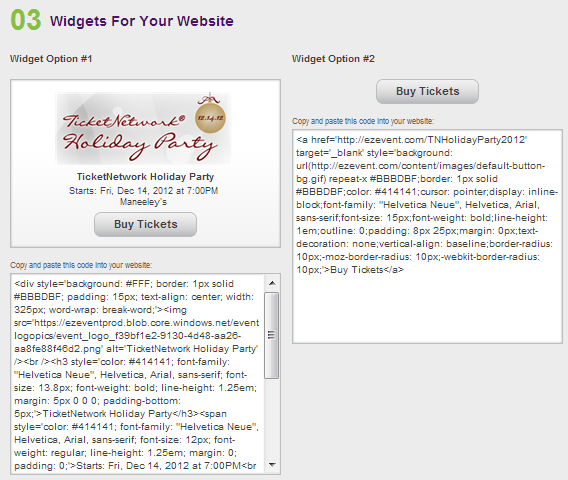 Widget Option #2 is a standalone Buy Tickets button that brings customers directly to your event page. To add either of these widgets to your website, copy and paste the provided HTML code, and add it to your website and emails. If you need to contact everyone who has purchased a ticket to your event, an easy way to do so is through the Email All Buyers/Attendees feature. This can be used if you need to cancel your event, the event is being postponed, if you have event updates, or if you want to send a general reminder about your event. All you need to do is enter in a subject line and enter your message in the Body field. Click the Send Message button and your email will be sent to everyone who has purchased a ticket. The text may not clear after you send the message, but be assured that it was sent. © 2019 ezEvent is a registered trademark of TicketNetwork, Inc.